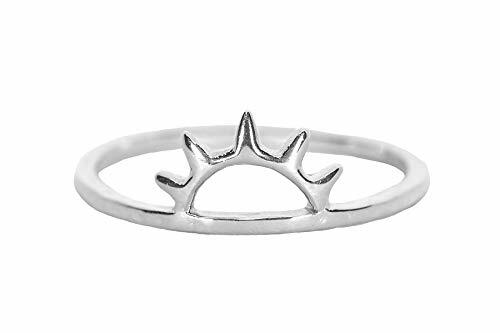 Let your natural beauty shine and radiate grace, simplicity, and elegance by wearing the Sunset Silver Plated Ring from Pura Vida! Add a touch of charm to your casual getup or to your dolled up look with this Pura Vida accessory that's exquisitely handmade by trusted artisans. Featuring a premium-grade .925 Sterling Silver construction, this ring is guaranteed to give lasting durability that will withstand everyday use. This jewelry piece has a delicate sunset charm on the head, granting the right amount of contemporary touch to its timeless design. Chic and sleek, it serves as a constant reminder to enjoy nature's beauty and live the pure life. Wear it alone for a classic style or mix and match with your favorite accessories for a statement look. Perfect for any occasion, the Pura Vida Sunset Silver Plated Ring is available in sizes five to nine to let you find one that perfectly fits you! If you have any questions about this product by Pura Vida, contact us by completing and submitting the form below. If you are looking for a specif part number, please include it with your message.